It’s finally that time of the year when red lights are decorating trees and Christmas balls are hanging on shops in the market. Yes, Christmas is coming soon! If you are tired of routine life and doing piles of work, you need a break and there is no perfect time for vacation than December. From snowy escapes to glittering cities, you can have a memorable Christmas this year. No matter where you’re traveling to, every city has a few things in common when it comes to Christmas – twinkling lights, Christmas balls, cozy corners, and the Christmas spirit. We have put the 10 best destinations below to help you have the most amazing Christmas holidays. Let’s have a look! The capital of Scotland is a cosmopolitan, historic and cultured city. The town is set beautifully that leaves locals and visitors in awe – a series of rocky crags and extinct volcanoes rise from the flat landscapes. Apart from its amazing architecture, the Scots celebrate Christmas in style and with marvelous decoration. There are a lot of things you can do during Christmas – visit Santa Claus, Christmas shopping, enjoy theater and music performance, seek holiday lights, try yummy food, see the Nativity in St. Andrew Square etc. Copenhagen is the capital of Denmark, the cheapest and most vibrant amongst the Scandinavian countries. The small and welcoming city offers a beautiful view during Christmas. The markets are flooded with Christmas balls and other Christmas decorations. Copenhagen zoo is lit by over 200,000 Christmas lights, Tivoli turns into a white wonderland, and Nyhavn’s colored houses are beautifully decorated with Christmas lights. Apart from this, you will also enjoy ice skating and a delicious lunch in December. The ancient place is present with the remains of more than two thousand years of habitation. There is so much to explore in the capital of Italy that even one-month stay is not enough to scratch the surface. From food to open-air museum to culture, the vibrant city has a lot to offer to its visitors. If you want to experience a traditional Christmas festival with full of faith then Rome is where you go. There are a very few suitable places for traditional Christmas celebration and Rome is the best of them. Lapland, the magical winter wonderland and home to Santa is a must-visit place in Christmas. The Santa Park and Santa Claus Village are the most favorite places of both local people and visitors. Not only this, but Finland’s northernmost region also offers the beautiful Northern Lights, experience wildlife, and enjoy ski at Yllas Ski Resort. You will simply love the mesmerizing town and make evergreen memories. East Asia’s most extraordinary city offers a very merry month with full of festive activities. Witness the city covered with Christmas lights, try dining in an igloo without heading to the North Pole, and enjoy the Christmas music blasts wherever you go in the city. This is not it – Italian Christmas Market, Stanley Plaza Christmas Market, and Christmas Gift Festival offer a variety of Christmas decorations and gifts. You will not regret visiting the city during the festive season. If you want to travel back to the old world then Boston is where you need to go. It is one of the US oldest cities which is most evident during the Christmas holidays. From the gas lamp-lit streets to huge tree in front of Faneuil Hall Marketplace, everything will give you Old time vibes. From concerts to classic holiday shows, the city is offering the best Christmas events this year. You will also enjoy ice-skating, twinkling trees, and holiday markets. Head to Boston to witness the old Christmas times. 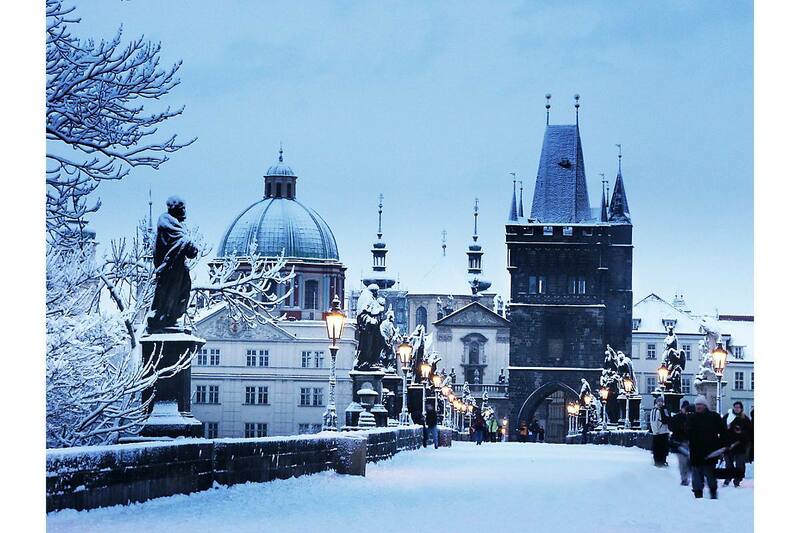 Undoubtedly, Prague is incredible during the Christmas season. As December arrives, the city wears the thick blanket of snow which gives magical vibes. When you are done visiting Christmas markets, have some warm time in cozy cafes. You will have a great time while sipping coffee and reading most beautiful quotes or listening to music. The capital city also owns art galleries and museums. Don’t forget to get into the Christmas spirits by singing carols in the Old Town Square while enjoying the festive surroundings. You will also love the Prague zoo and the beautiful view the city offers during ice skating. Berlin is always inviting! Regardless, you visit Germany’s capital in summer when you can have crazy hangouts. It is an ideal place to party around in the last month of the year, December. In fact, this is one of the most visited places for Christmas festivities. You can have a great time in its bars and clubs. Also, many cultural events are held in the city to experience. If you want to have a romantic walk under Christmas lights, go to Unter den Linden.